Outdoor workers are ever mindful of how changes in the weather can make a big difference to the way they would view risk. And it seemed that in July, following day after day of rain that a plotting contractor working for PF Olsen had to re-evaluate and alter his response. This meant that he spent an unplanned night in Pirongia Forest when he chose the safe option of not crossing a ford where the water level was too high. “Prior to entering a forest, all persons shall be familiar with the weather forecast, including predicted wind speeds and heavy rain. Making the decision not to risk crossing, Tony called his wife and supervisor to inform them of his situation and used his phone to take a photo of the ford (see below). He was prepared with spare warm clothes and plenty of diesel to run the vehicle heater. Tony comments that he ate his remaining lunch for dinner – a homemade chocolate chip biscuit and an apple and then spent the night in his ute. He says that the experience was “better than a long plane flight”. In the process of deciding what to do, Tony considered the volume of water flowing and the fact that there was a waterfall further down the river. If he attempted to cross the flooded ford he risked getting water in the motor and becoming stuck part way, which could result in the ute being pushed down the river towards the waterfall. A couple of weeks earlier two people lost their lives attempting to cross a swollen river on the West Coast. With those factors in mind, his conclusion was that he would be safest in his vehicle and so he hunkered down with his chocolate chip biscuit. This is the value of experience and in applying the guidance material. We commend this course of action because Tony chose the safe option over his comfort or any other priority. Had he not, this may well have been a different story. When he crossed the ford the next morning at 7am, his first stop was the Pirongia Bakery which, to his dismay, told him it was too early to make him fish & chips! 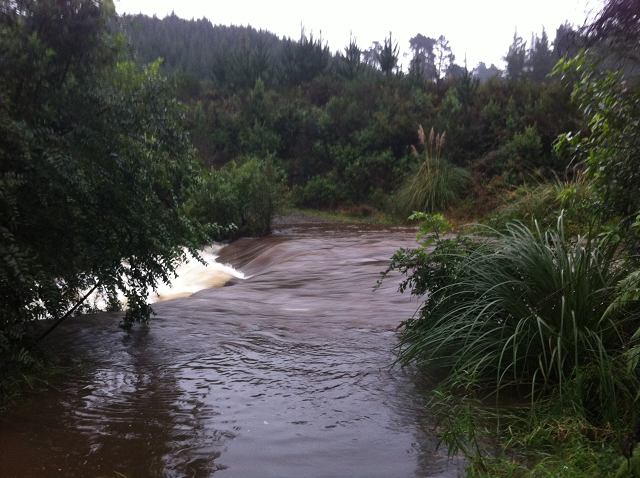 Tony Caird made a wise decision not to cross this swollen river in Pirongia Forest even though it meant a night sleeping rough.